The City of West Branch is a growing community outside of “Iowa City” which is the home of one of Iowa’s largest Universities. West Branch is also privileged to be the home of one of only 13 Presidential Libraries in the nation. This alone demands year around tourism that attracts visitors from national and international origins. West Branch has many opportunities for economic development, whether small business or large corporation (see: Market Study and Strategy). Our community’s vibrant downtown offers historic storefronts for you to run your small business while the Hoover National Historic Site and growing community provide a growing base from which to develop a thriving business model. Large corporations looking for a location could ask for no better. With an industrial park located directly off of Interstate 80, West Branch offers you space to develop with transportation access to the entire width of the United States. Large or small, you will find success in West Branch! 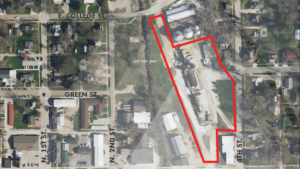 Downtown East Redevelopment Project – The City of West Branch is very interested in hearing from qualified developers (individuals or firms) interested in presenting a viable design and development concept for a mixed-use development on 3.450 acres of real estate located in Downtown West Branch, Iowa, owned by the City of West Branch. The site has recently been used as concrete ready-mix plant. Using existing grain elevators… the city is looking for a creative approach to development that accommodates entertainment venues such as a city market, hotel, housing, brewery and/or other significant mixed-used developments on the site (all ideas will get considerable review and investigation). The following documents are intended to provided interested developers and investors with background information that could assist their research and value propitiation processes.